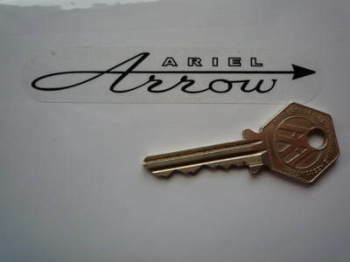 Ariel '200' Arrow. England. Circular Stickers. 2" Pair. 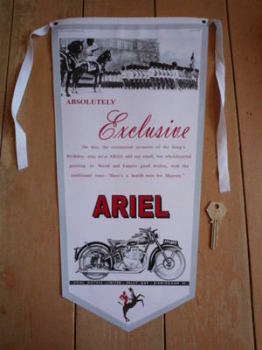 Ariel Absolutely Exclusive Banner Pennant. Ariel Absolutely Exclusive Oblong Sticker. 6.5". Ariel Adds Colour To Motorcycling Art Banner. Special Offer to Clear. 19" by 25". Ariel Arrow Black & Clear Frame Sticker. 4". Ariel Champion Spark Plug HT Cap Cover Badges. 29mm Pair. 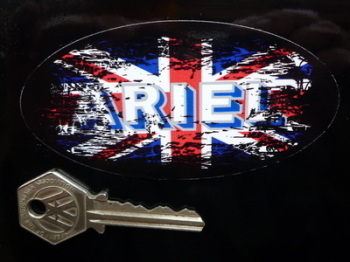 Ariel Fade to Black Union Jack Sticker. 4". Ariel Get Together With An Ariel Advert Style Laser Cut Magnet. 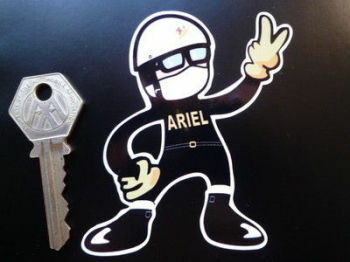 2.5"
Ariel Get Together With An Ariel Oblong Sticker. 6.5". Ariel Horse's Head & Horseshoe Headstock Sticker. 2.5". Ariel Horse's Head & Scroll Logo Sticker. 2.75". Ariel Horse's Head Handed Logo Stickers. 40mm Pair. Ariel Leader & Arrow Banner Pennant. 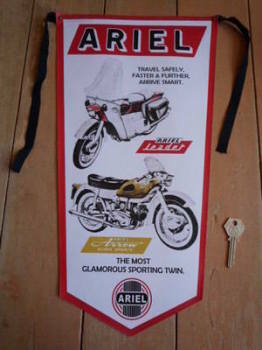 Ariel Leader 250 Art Banner. Special Offer to Clear. 29" x 26". Ariel Leader Arrow Hunter Square Circular Stickers. 2.25" Pair. 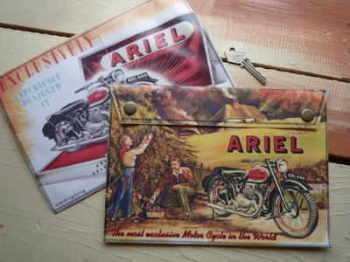 Ariel Lined Logo Flag & Scroll Sticker. 3.75". Ariel Made in England Black & Silver Circular Stickers. 2" Pair. Ariel Motors Ltd on Clear Frame Sticker. 2.25". 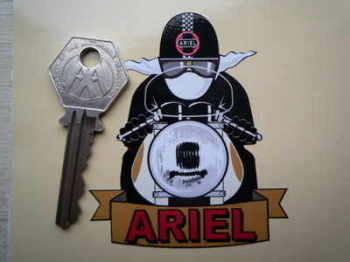 Ariel Motors Ltd Oval & Banner Logo Sticker. 3.25" or 4.75". Ariel Motors Ltd, Selly Oak, Art Banner. 28". Ariel NGK Spark Plug HT Cap Cover Badges. 22mm Pair. Ariel Rearing Horse Flag & Scroll Sticker. 3.75". Ariel Rider Pudding Basin 2 Fingered Salute Sticker. 3.5". 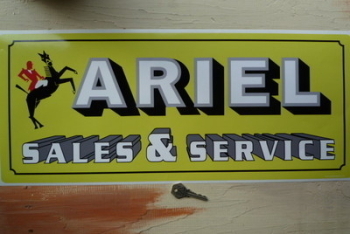 Ariel Sales & Service Sticker. 23.5". Ariel Shadow Text Blue & Grey Stickers. 3" or 5" Pair. Ariel Shadow Text Metallic Black Edged Stickers. 5" Pair. Ariel Shadow Text Metallic Red Edged Stickers. 5" Pair. Ariel Sunburst Art Banner. 22" x 27". Ariel Text Style Window Sticker. 6" or 11". Ariel. Cafe Racer. Pudding Basin Helmet. Sticker. 3".